I’m squeaking this in just as the biathlon circuit gets going again. This will be a really quick post just recapping how the US has done on the WC circuit so far this season. I’m not even going to cover everyone that’s had a WC start, just the “major players” so far. 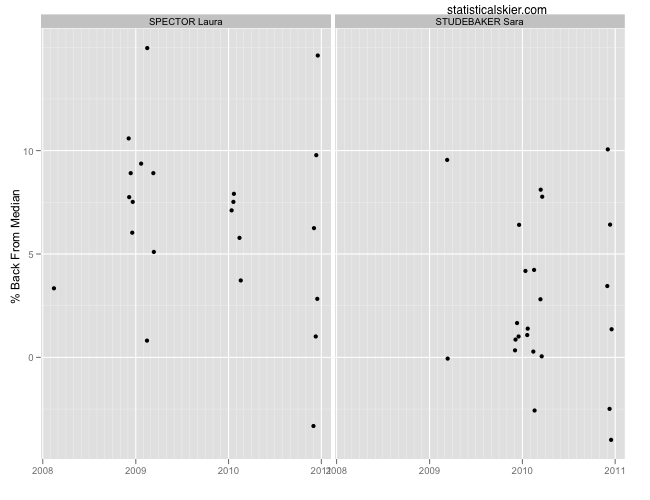 Laura Spector hasn’t been terribly consistent, but she’s been quite a bit faster than last season on a few occasions. Sara Studebaker has only been slightly more consistent, but has one more solid race under her belt so far this season. They are both still struggling to break through the median skier barrier, but they’re both fairly young and seeing at least some results that are an improvement on last season. 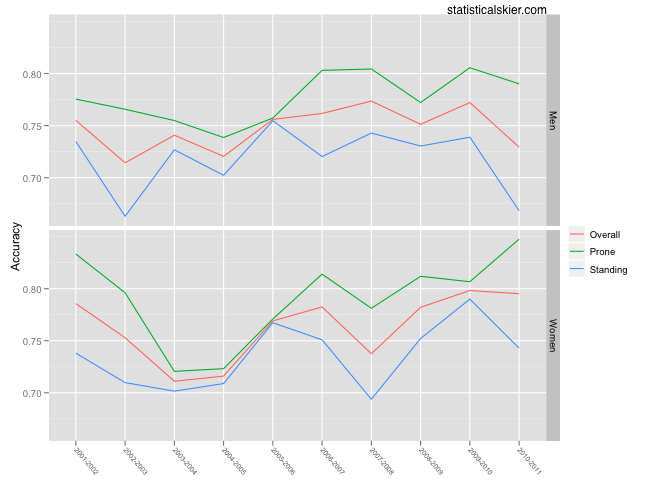 Not enough data on Nordgren to say much, but Bailey, Burke and Teela have all taken a bit of a step backward it seems. I’m not quite as up on USA biathlon gossip, so I’m less aware of stuff like illnesses, injuries or other training problems, which could be a factor here. These are shooting statistics averaged over the whole US team for each season in WC, OWG or WBC races. Keep in mind that the 2010-2011 statistics have a smaller sample size than the other seasons. The women have been holding steady, despite some fluctuations in their prone and standing shooting, but the men have generally seen a bit of a drop off. Posted by Joran on Wednesday, January 5, 2011, at 12:00 pm. Filed under Uncategorized. Tagged biathlon, jeremy teela, laura spector, leif nordgren, lowell bailey, midseason, review, sara studebaker, tim burke, USA, World Cup. Follow any responses to this post with its comments RSS feed. You can post a comment or trackback from your blog.